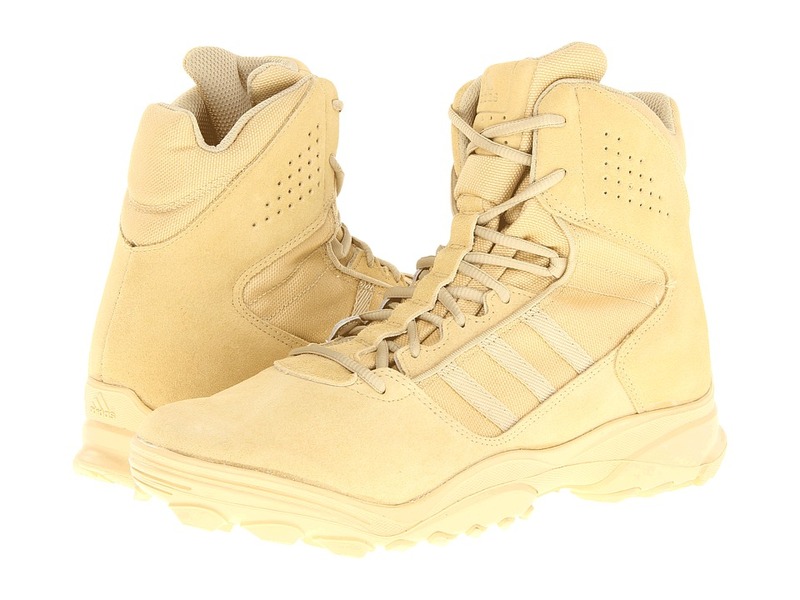 Combat-boot tough gets an athletic backup in the adidas GSG-9.3 Desert Low boots. Heavy-weight CORDURA nylon upper for superb durability and comfortable foot climate. Suede overlays for added support and protection. adiTUFF inserts for best abrasion resistance. Large radius medial arch area for safe and precise rappelling maneuvers. Antistatic. 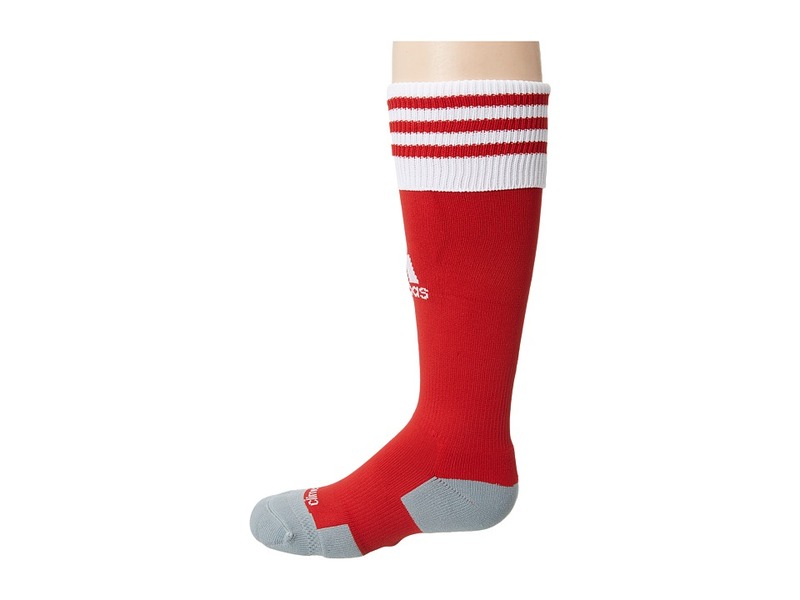 OrthoLite odor-resistant moisture-wicking sockliner. Air mesh lining for maximum breathability. adiPRENE heel for superior cushioning at impact. Engineered tactical TRAXION outsole for maximum grip in all directions. Measurements: Heel Height: 1 1 4 in Weight: 1 lb 9 oz Circumference: 14 in Shaft: 6 1 2 in Platform Height: 1 2 in Product measurements were taken using size 11, width D - Medium. Please note that measurements may vary by size. Weight of footwear is based on a single item, not a pair. 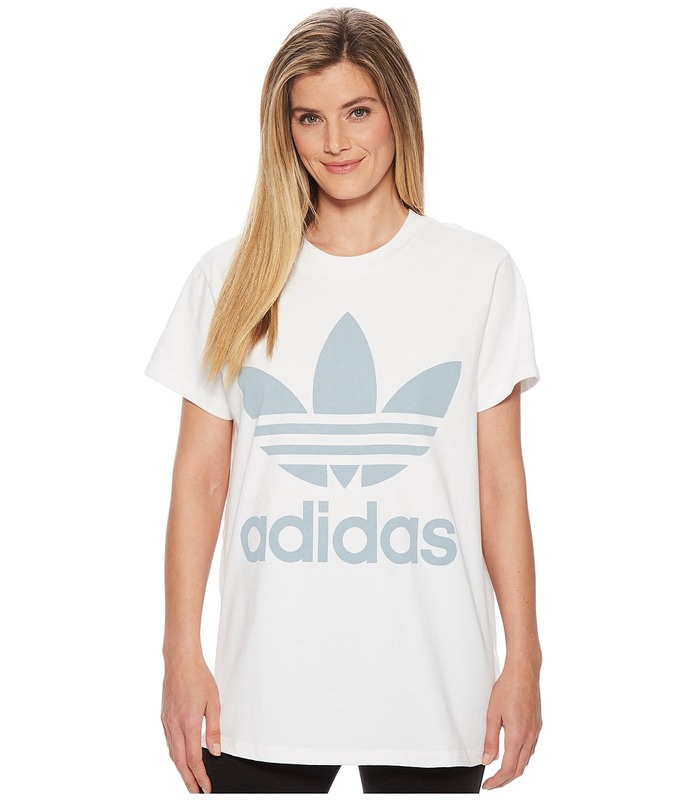 Add a little comfort to your workout ensemble with the Big Trefoil Tee from adidas Originals. Extra-wide crewneck. Cap sleeve design. Raglan sleeves for freedom of movement. Large trefoil graphic on bottom front hem. Trefoil logo at upper left chest. Straight hem. 100 percent cotton. Machine wash cold, tumble dry low. Imported. Measurements: Length: 25 in Product measurements were taken using size XS. Please note that measurements may vary by size. 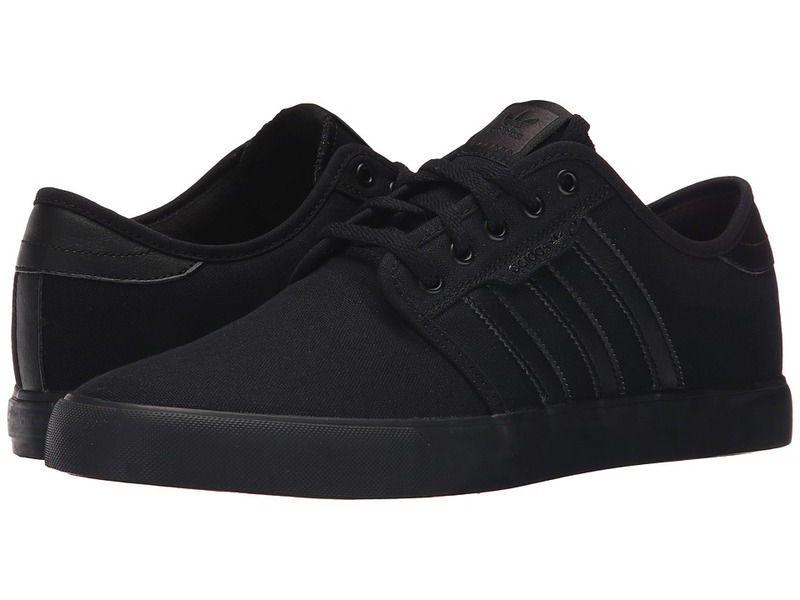 Skate with reckless abandon or chill accordingly with the time-tested flavor of the Seeley from adidas Skateboarding. Uppers of suede, canvas, or synthetic nubuck. Synthetic leather 3-stripes. Grippy vulcanized rubber outsole for added performance. Herringbone tread pattern. Imported. Measurements: Weight: 12 oz Product measurements were taken using size 8, width D - Medium. Please note that measurements may vary by size. Weight of footwear is based on a single item, not a pair. 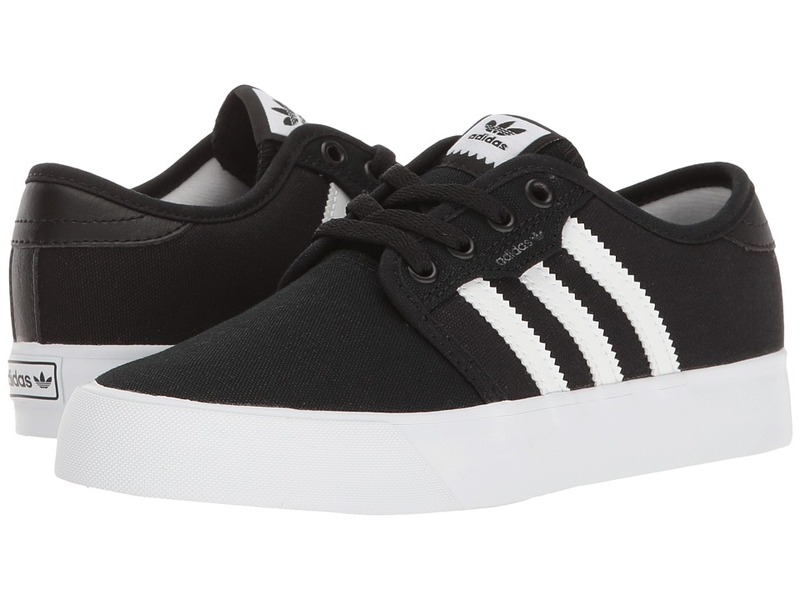 Little dudes will always look fresh when wearing the Seeley from adidas Skateboarding! Uppers of suede, canvas, or synthetic nubuck. Synthetic leather 3-Stripes. Grippy vulcanized rubber outsole for added performance. Herringbone tread pattern. Imported. Measurements: Weight: 7 oz Product measurements were taken using size 1.5 Little Kid, width M. Please note that measurements may vary by size. Weight of footwear is based on a single item, not a pair. 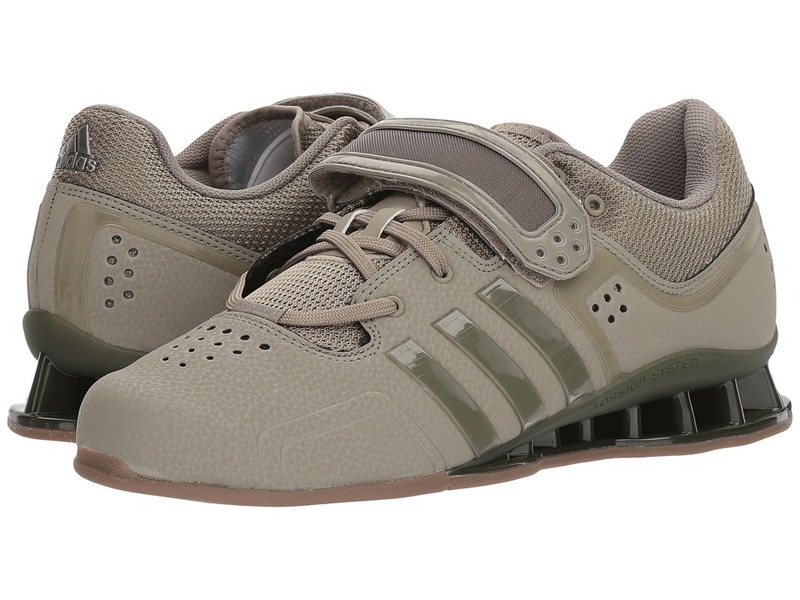 Whether you~re trying to bulk up or just maintain good, proper technique, let the adipower weightlifting shoes from adidas get you there! PU-coated leather upper with mesh panels for durability and breathability. Lightly padded collar and tongue. Comfortable textile lining with TORSION SYSTEM for midfoot integrity and lightweight arch support. Traditional lacing closure with a single instep strap combines to provide additional support. Perforated toe box for added ventilation. Lightweight, injected-polymer in structured strength design engineered specifically for weightlifting. Integral 24mm heel-support wedge and 4mm forefoot for superb, lightweight stability. 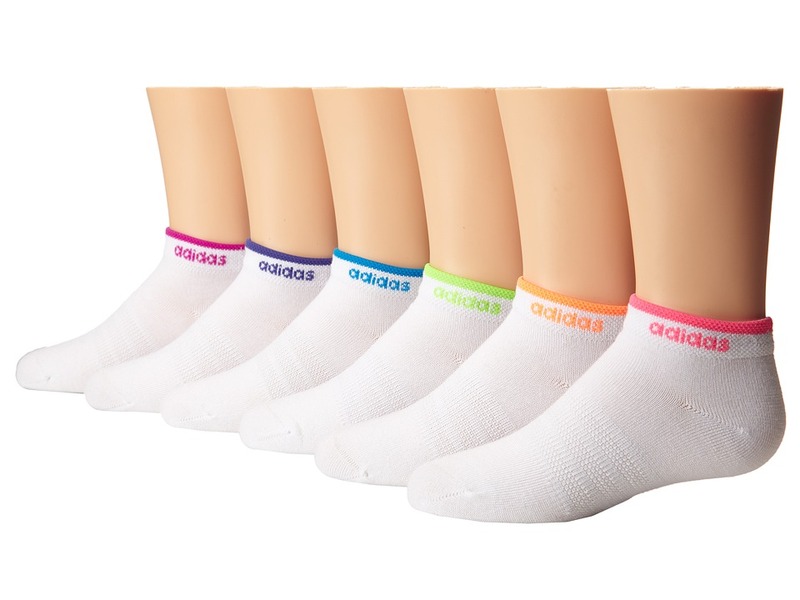 adiWEAR outsole offers the ultimate in high-wear durability and grip. VentFlow openings on the outsole delivers comfortable foot climate. Imported. Measurements: Weight: 1 lb 3 oz Product measurements were taken using size 12, width D - Medium. Please note that measurements may vary by size. Weight of footwear is based on a single item, not a pair. 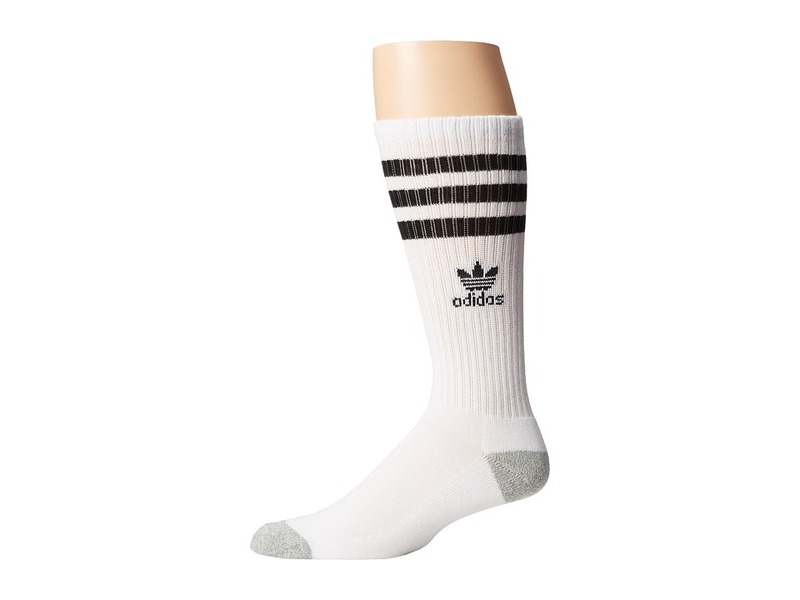 Nothing completes your throwback look like the classic appeal of this adidas crew sock. Ribbed cuff in a crew length. Contrasting stripes at calf. Iconic trefoil logo at calf. 83 percent acrylic, 13 percent polyester, 2 percent Spandex, 2 percent latex rubber. Machine wash cold, tumble dry low. Imported. 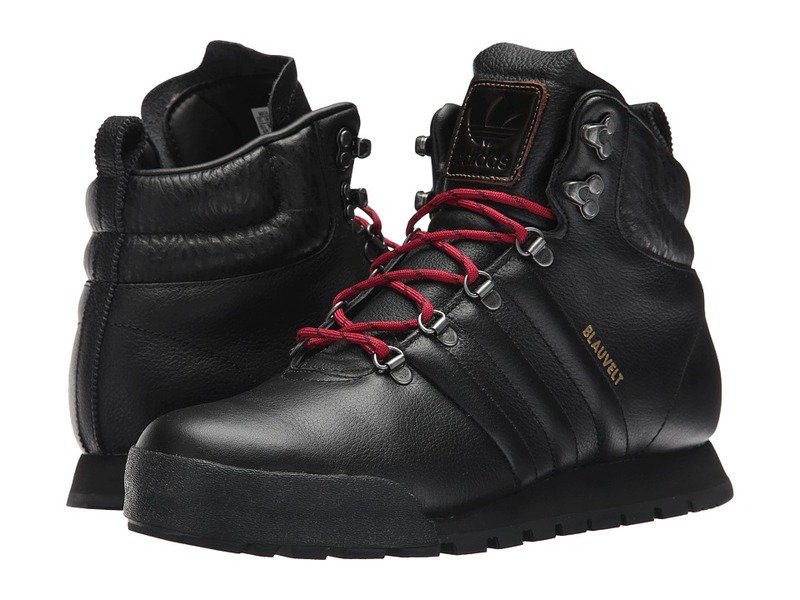 Rugged good looks and casual feel collide with the stylish adidas Skateboarding Jake Boot! Premium leather upper. Textile collar with rubber toe bumper. Gusseted tongue helps keep out water and snow. Metal eyelets and hooks. EVA midsole for long-term lightweight cushioning. Lug outsole for grip. Imported. Measurements: Weight: 15 oz Product measurements were taken using size 6, width D - Medium. Please note that measurements may vary by size. Weight of footwear is based on a single item, not a pair. 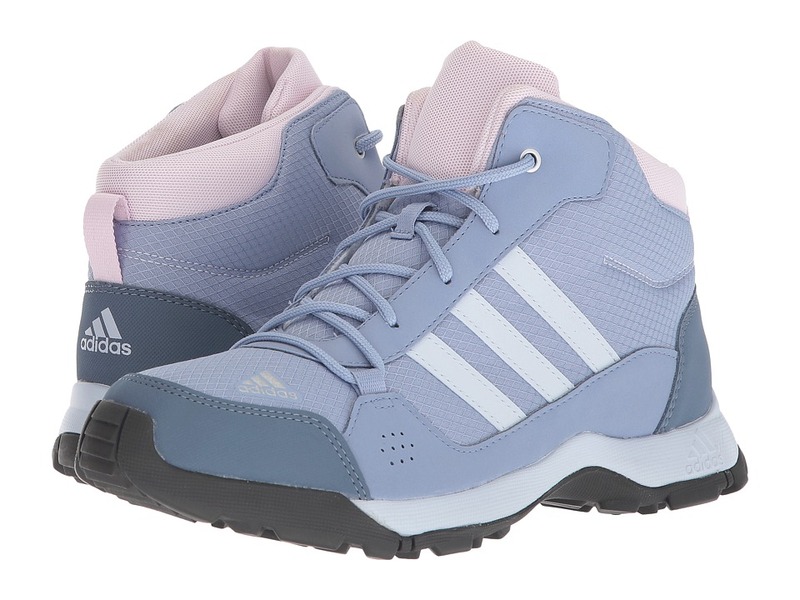 Hyperhiker from adidas Kids, the all-day adventure shoe for little ones! Durable textile and synthetic upper. High-top silhouette. Traditional lace closure for a secure and custom fit. Padded tongue and collar for comfort and support. Pull tab at back assists with entry. Lightweight EVA midsole for long term cushioning and comfort. Grippy TRAXION outsole ideal for wet and slippery conditions. Reflective logo for enhanced visibility and safety in dark environments. Imported. Measurements: Weight: 13 oz Shaft: 4 3 4 in Product measurements were taken using size 7 Big Kid, width M. Please note that measurements may vary by size. Weight of footwear is based on a single item, not a pair. 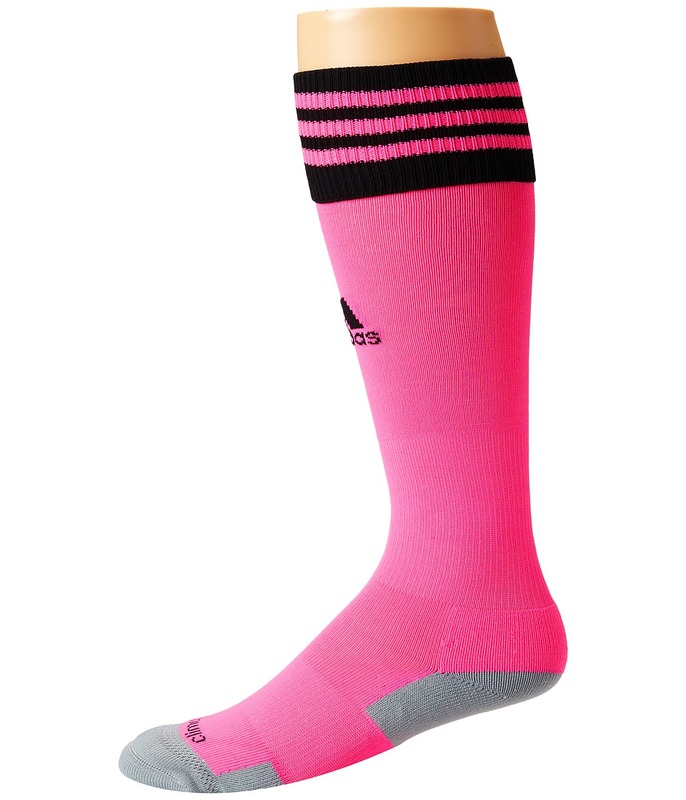 Have the little on hitting goals left and right with the Team Speed Soccer Sock from adidas Kids. climacool provides 360&amp#186 cooling for the entire foot. FORMOTION follows the natural movement of sport for a better fit and greater comfort in motion. Cushioned footbed for shock absorption during any activity. Compression in ankle and arch for added stability. Anatomically shaped left and right sock. 98 percent nylon, 2 percent Lycra spandex. Machine wash cold, tumble dry low. Imported. 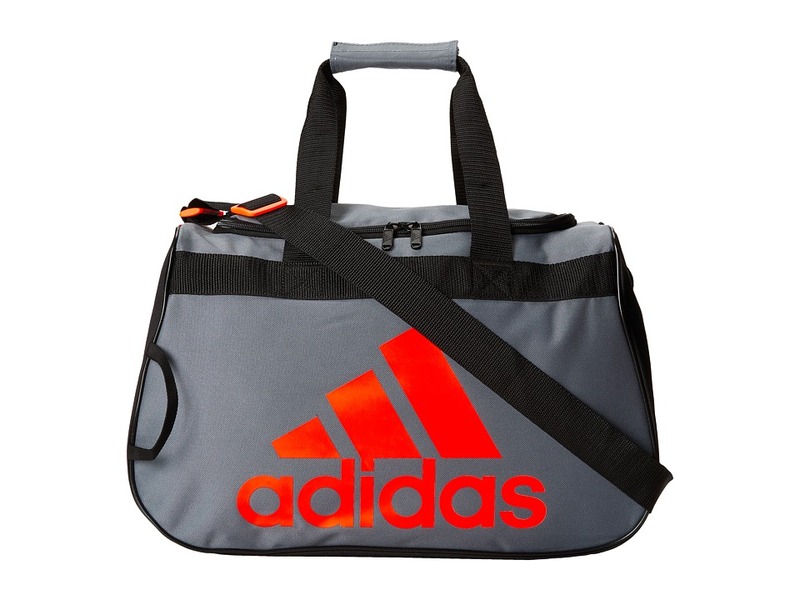 Have the little one~s feet comfortable while hitting home runs with the Copa Zone Cushion II from adidas Kids. climalite fabric sweeps sweat away for your skin for ultimate comfort. Toe-cooling channel for added ventilation and breathability. Targeted cushioning on footbed for shock absorption. Added compression in ankle and arch. 3-Stripes logo detail on the cuff and adidas brandmark around the ankle. 98 percent nylon, 2 percent Lycra. Machine wash cold, tumble dry low. Imported. 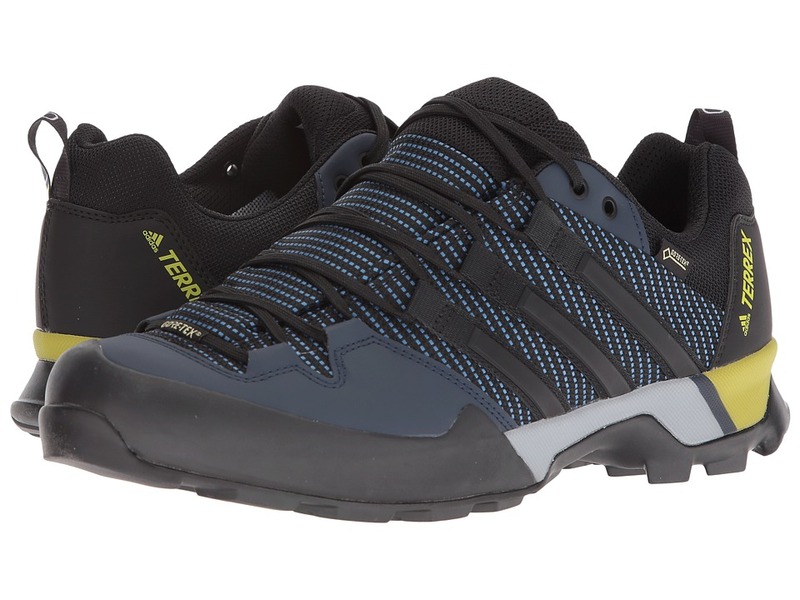 Climb to new heights or explore the unknown path in the high-performance Terrex Scope GTX from adidas Outdoor. A versatile, lightweight approach shoe. Durable textile and synthetic upper materials. 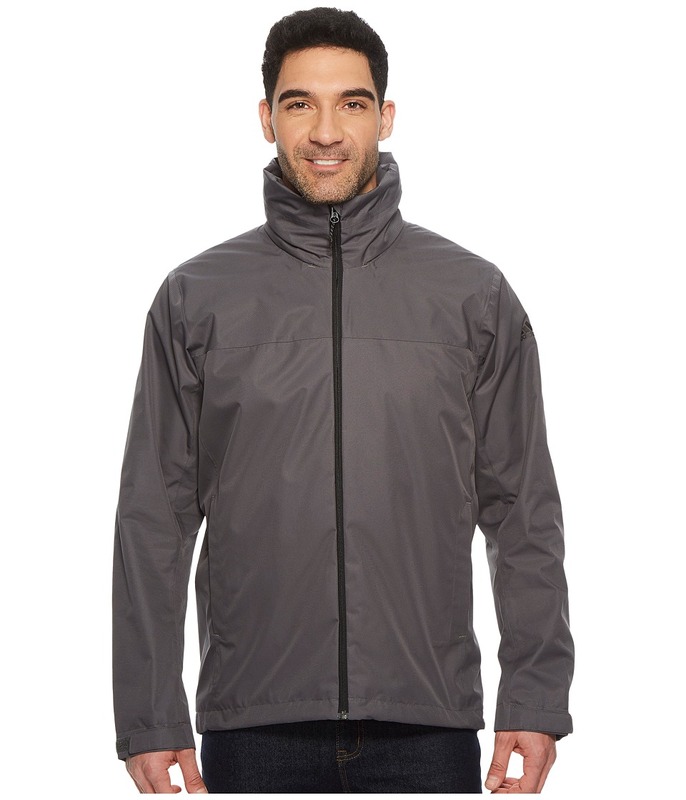 GORE-TEX technology ensures breathable, waterproof protection from the outside elements. Molded EVA tongue for next-to-skin comfort. Protective toe rand. Heel pull for an easier on and off. Soft fabric lining for a great in-shoe feel. Molded foam sockliner supplies light underfoot comfort. adiPRENE insert absorbs shock for enhanced comfort. Approach-specific outsole features Stealth rubber to deliver optimal grip and friction. Imported. Measurements: Weight: 1 lb 3 oz Shaft: 4 in Product measurements were taken using size 12, width D - Medium. Please note that measurements may vary by size. Weight of footwear is based on a single item, not a pair. When you~re miles away from the camp site and you see those clouds rolling in over the horizon, you don~t have to stress, because you have the weatherproof protection of the Hiking Wandertag Jacket stowed away in your pack. Regular Fit. CLIMAPROOF fabric: &amp#8226 Waterproof and windproof protection. 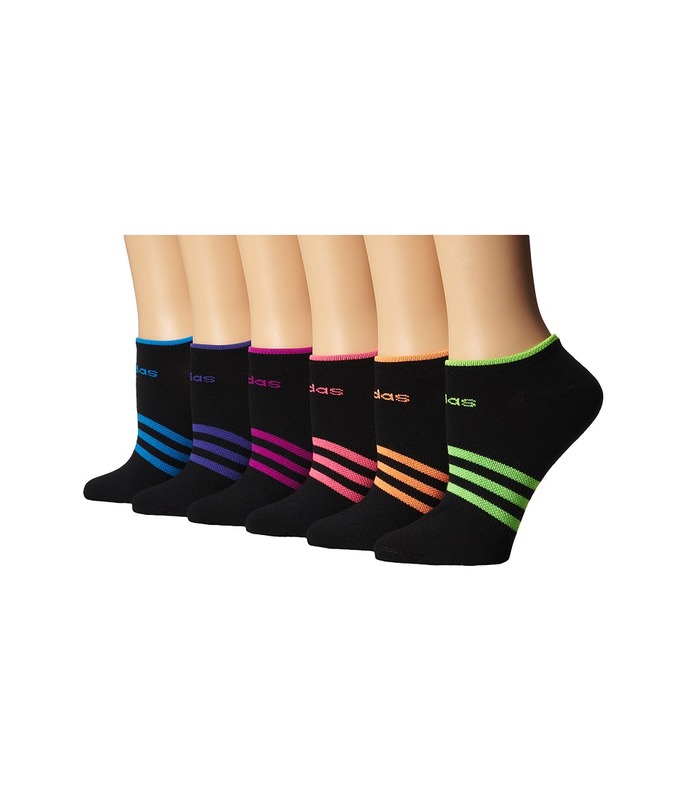 &amp#8226 Breathable design speeds passage of moisture vapor from perspiration. &amp#8226 Durable nylon ripstop. Stand collar with roll-out, drawstring hood. Full-length zip with zipper garage. Hook-and-loop cuffs. Inner zip pocket. Zip hand pockets with venting mesh lining. Droptail hem with elastic drawcord. Breathable, mesh-lined back panel. 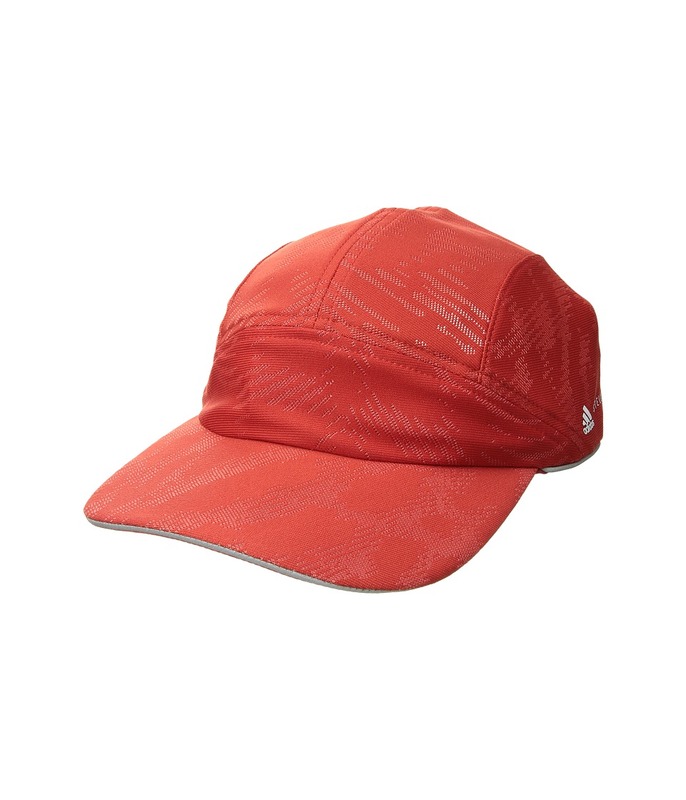 Outer: 100 percent nylon Inner: 100 percent polyurethane Mesh: 100 percent polyester. Machine wash and tumble dry. Imported. Measurements: Length: 33 in Sleeve Length: 37 in Product measurements were taken using size MD. Please note that measurements may vary by size. A workout tank that takes you to a better place. Climalite&amp#174 fabric blend has a soft feel with moisture management. Inner bra support. Crossed racerback straps. Rope-inspired graphic on the back. 73 percent organic cotton, 27 percent recycled polyester. Machine wash cold, hang to dry. Imported. Measurements: Length: 25 in Product measurements were taken using size SM (US 4-6). Please note that measurements may vary by size. 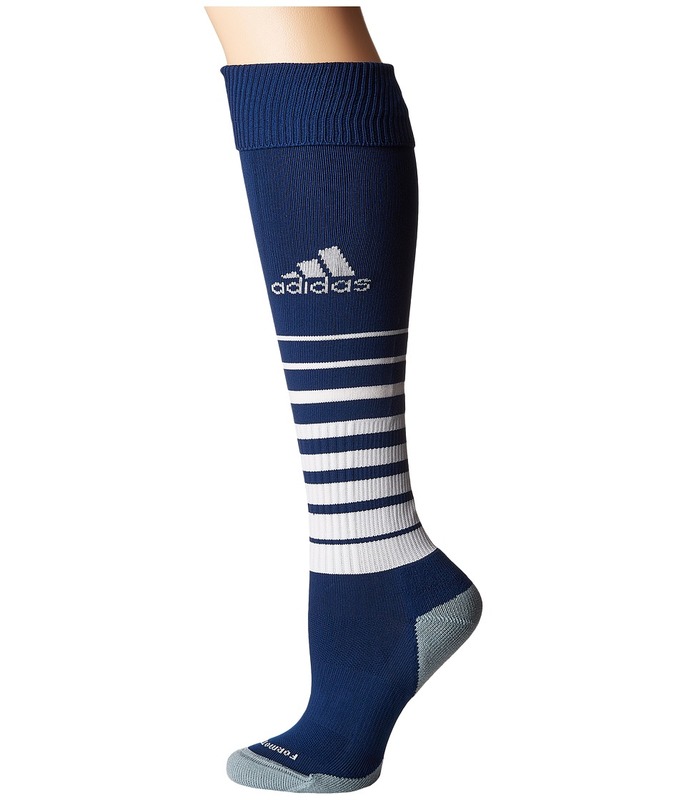 Own the pitch with the help of your trusty adidas soccer socks. Ribbed crew style design. ClimaLite fabric wicks moisture away from the skin. Targeted cushioning for protection right where it~s needed. 98 percent nylon, 2 percent elastane. Machine wash cold, tumble dry low. Imported.